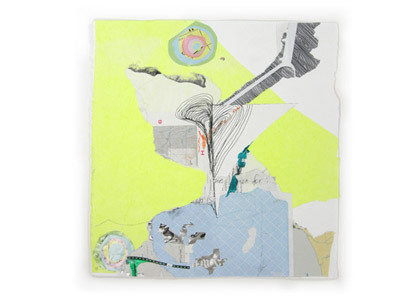 "I began building on a piece of land"
is part landscape painting, part collage. The surfaces of some pieces are heavily built up from found bits of paper and debris, while others are delicately rendered in pencil and thin washes. Each describes a specific topography that Kesler encountered on her recent drive across the United States. Christine Kesler is an artist who just made the move from Brooklyn, NY to San Francisco, CA where she is pursuing her MFA at CCA. Christine Kesler’s Artist Statement In this age of immediacy and often-overwhelming wealth of information, the process of combining media is my driver for new discoveries and associations. My work is an investigative process of collecting languages, both visual and written, and finding new ways to map experiences. I gravitate towards items and images with palpable personal associations, such as my own photographs and found printed papers and handwritten notes. The photos document a specific place in time, found handwriting is a symbol for the conversations and secrets of strangers. This work means to explore the nature of material, converting literal objects into a new means of mark-making. Sourcing found papers and my own drawings and photos, a somewhat cryptic environment emerges, layered with visual representations of various lands and languages, giving evidence of distances traveled by combining raw materials found in the streets of Central America, Europe, and North America. Each work calls into question the process of making art and taking directly from ones surroundings. The viewer is invited into these spaces to find their own relationships between the abstract and the literal, the foreign and the familiar.